I think this site's name will change to Urban Chicken Nation, there's such a fascination with chicken and here's the coupon for FREE Kentucky Fried Chicken ... oops I mean Kentucky GRILLED chicken. Just remember you can't use it on Mother's Day. 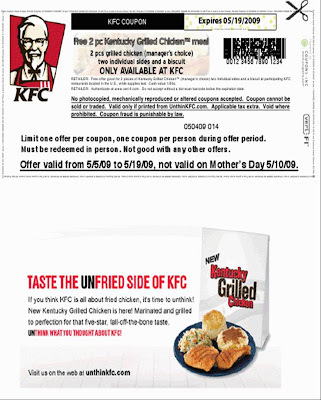 Now who is so trifling to take their wife, mom, or babies' mamas to KFC on Mother's Day. Do people really like over-processed, massed-produced chicken that much? You have to give the people over at KFC credit for marketing this new product to the African American community. I guess it doesn't hurt to have Oprah backing you either. They've got this down to a science. I received a chicken coupon in my in box... a chicken coupon! If you've ever doubted the power of the media then watch the following clips... have you ever seen anything more embarrassing? This is sad. Not the unpreparedness of Popeye's, but the way folks can't figure out how to go to the local supermarket, buy some chicken, take it home and cook it! It's also disturbing to watch the TV news anchors laugh it up. (yuck, yuck, ha, ha) What's so f***** funny? Again I say images and influences in the media are so powerful.